The three St Andrews teams in Division 2, had all qualified for the semi-finals of the Secondary Shield tournament held at the Ward Road Gym in Dundee on the penultimate Saturday before Christmas. The fourth team remaining in the competition was Villa, the current leaders of the second division. On one side of the room dividers, Swots were up against New Kids. Collin Bleak drew the first blood against Kong Wan with an easy straight sets victory. Just back from a gardening injury, Kong had brought an old bat with him by mistake which had very little grip. Howard Lee levelled the match against reserve Chris Wroniecki, but this was far from a comfortable win. Nick Shepherd put Swots in front again by beating Ian Smith in four games, but Howard once again evened up the scores with a narrow victory over Collin. Immediately, Nick responded by defeating Kong in three games, before Chris slayed Ian to put Swots within one point of qualifying for the final. One chance was all Nick needed to seal the victory for Swots with a four game win over Howard by 5-2 overall. On the other side of the dividers, Truants were playing their semi-final against Villa. Unfortunately, Truants were without their injured star player Sascha Roschy who was supporting from the sidelines. Villa got off to a flying start, taking the first two matches. Alain Léger from Truants reduced the arrears with a narrow victory against Sandy Bertie, but Villa took the next three games to qualify for the final 5-1. Swots were very much the underdogs in this final against the division topping Villa. However, with a strong core of players supplemented by an excellent reserve, they caused a lot of problems for the favourites. Chris and Nick both beat Sandy Bertie and Ian Hunter, but stalwart Ian McLagan held on strong to pip Swots to the post 5-4 and claim the silverware. In other news, Truants had a tough battle against first division Rockets in the Stanley Doubles cup. Despite winning the opening match, the Rockets took off and powered to a 5-1 victory. New Kids were also competing in the Stanley Doubles, but were narrowly edged out by Villa in a tense encounter settled in the deciding match. Prospects had a night to forget as they failed to bring a single point home from Telecom House in their encounter with Tass. Finally, Michael Hahn scored perhaps his most meaningful hat trick of the season against Up4It (current first division leaders), remaining unbeaten though his team mates were less successful. Final score 7-3 to Up4It. 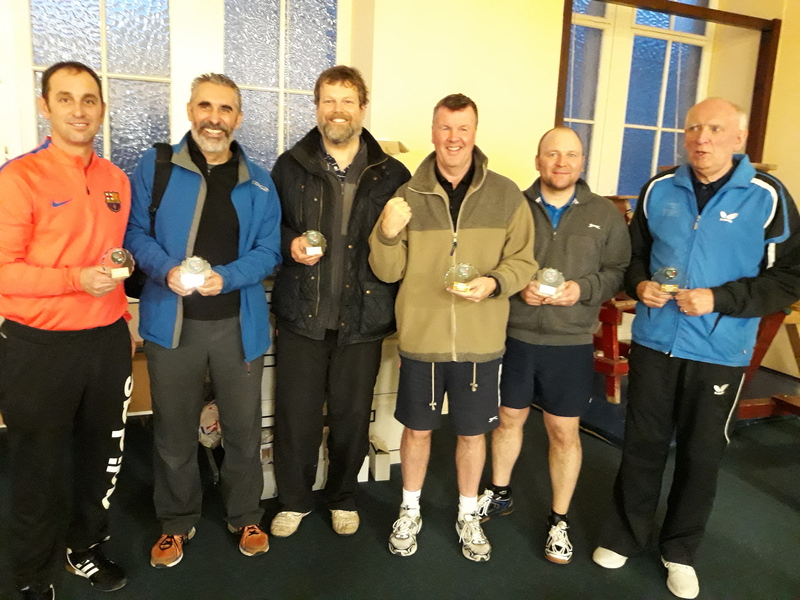 This entry was posted in Match reports, St Andrews Table Tennis Club on December 20, 2018 by standrewstt.